Nordea is a leading provider of financial solutions to large Nordic and international corporates, institutional customers and public companies. We are the largest Nordic bank and a highly respected player serving 11 million customers within 600 branches. Our customers are served through a Nordic organisation and our international offices all the way from New York to Moscow and Singapore. 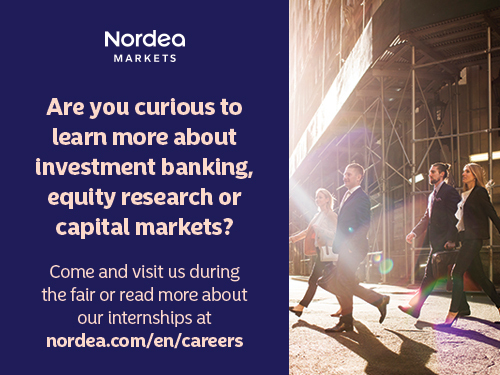 At Nordea we are always looking for new talent. No matter if you are a freshman or at the stage of finalising your thesis, we have the opportunities for you. If you have a strong interest and curiosity in the financial markets, we would like to meet you.